GreenCloud is a packet level simulator that uses the existing Network Simulator 2 (NS2) libraries for energy-aware data centers for cloud computing. It models the various entities of cloud such as servers, switches, links for communication and their energy consumption. It can be helpful in developing solutions for resource monitoring and allocation, scheduling workloads for number of users, optimizing the protocols used for communication and also provide solutions for network switches. The data center upgradation or extension may be decided using this tool. NS2 uses two languages C++ and Otcl (Tool Command Language). The commands from TCL are usually passed to C++ using an interface TclCL. GreenCloud uses 80% of the coding is done using C++ (TclCL Classes) and remaining 20% coding is implemented using Tcl scripts (Commands are sent from Tcl to C++). GreenCloud is developed by University of Luxembourg and released under the General Public License (GPL). GreenCloud Tool is developed mainly for debian based systems like (Ubuntu, Debian, Linux Mint, etc). The tool will be comfortably work with Ubuntu 12.x and afterwards with a kernel of 3.2+. GreenCloud also comes with a preconfigured VM which includes Eclipse to debug ns, modifying the source code and to start/run simulations. 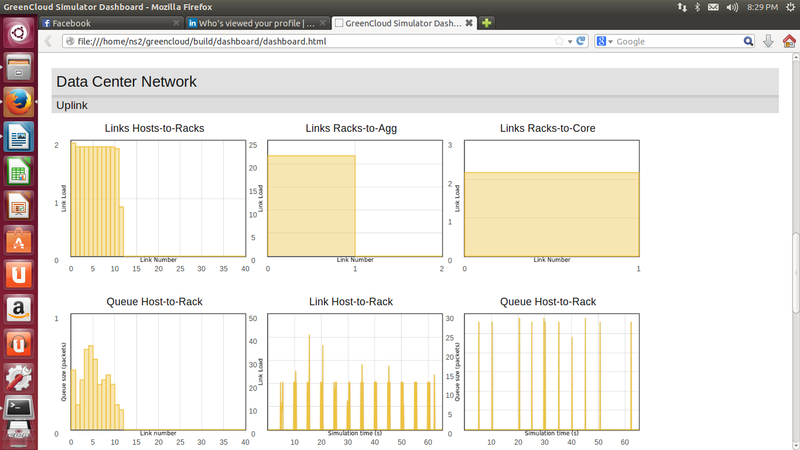 http://greencloud.gforge.uni.lu/ftp/greencloud-v2.0.0.tar.gz. Execute the command as specified below. 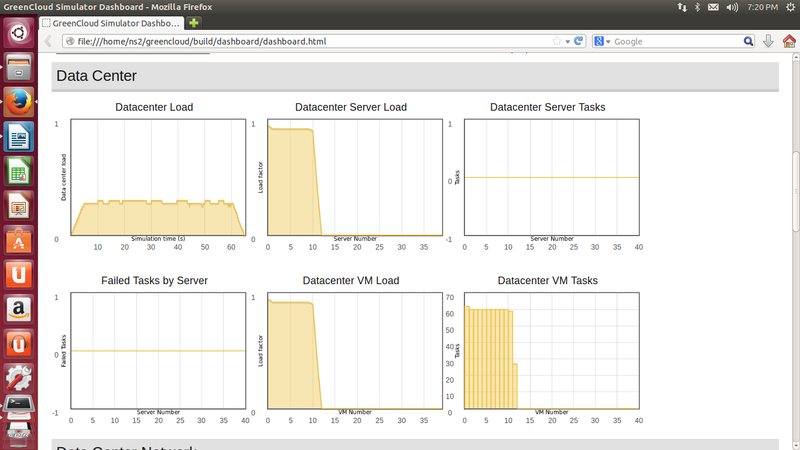 The GreenCloud comes with a default test simulation with 144 Servers with one Cloud User. All of the parameters can be varied and tested based on the inputs given to the Tcl file. finish.tcl – prints the statistics. The output can be viewed using the browser using the show-dashboard.html file by running the ./run scripts. The ./run scripts consists of the following parameters Data center load, Simulation Time and Memory requirement. The Data center load specifies the value from 0 to 1 (the values near 0 indicates the idle data center and while the load closer or greater than 1 indicates the saturation of data center). The simulation time specifies the task that can be scheduled under a VM or a single host based on the deadlines of the task. 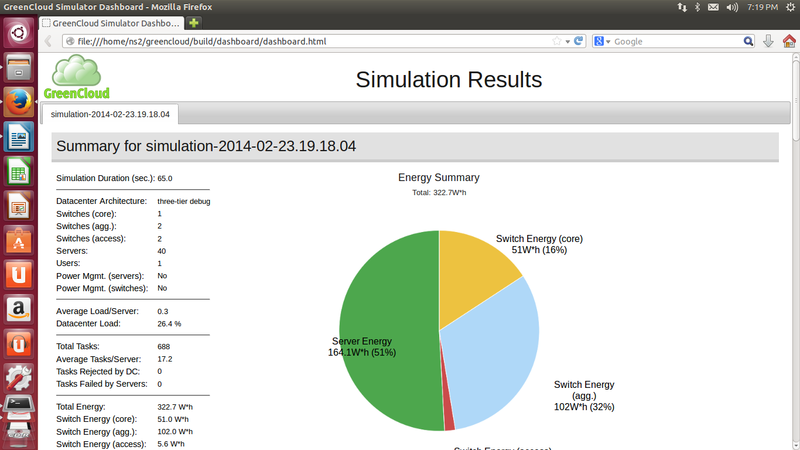 The simulation results are processed in the ~greencloud/traces/ directory. There are various trace files that records the information from data center load, main tasks, switch tracing, loading, etc. 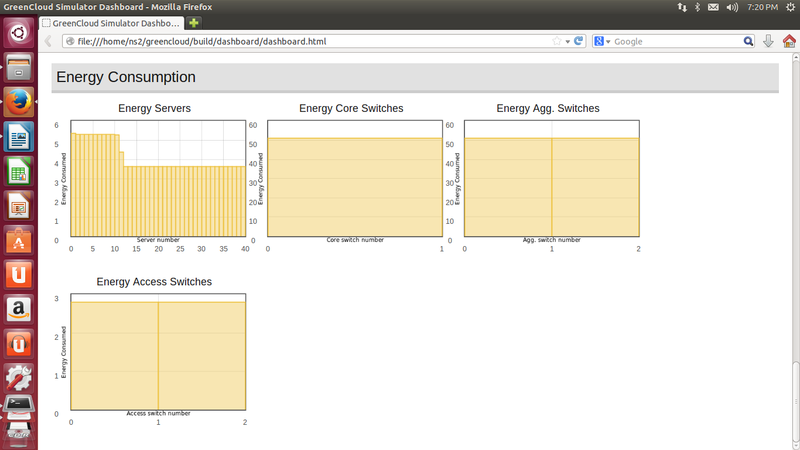 The graph in the browser shows 4 parts, Simulation summary as shown in Table 1, Data center characteristics as shown in Figure 3, DC Network characteristics as shown in Figure 4 and Energy consumption details as shows in Figure 5. Multiple simulations can be performed using a single run script. In these case, the results are plotted in as a tabbed pane. The above sections shows the parameter changes in the existing network and to analyse the results. However, if a researcher is trying to configure a CPU, HPC Cluster, Cache Memory alteration, handling of Virtual Machines, etc, then there should be code modification in the source files (.cc and .h). if a file called cpu.cc is modified and have to be recompiled using the make command as shown below. If new set of files (newfile.cc and newfile1.cc) are added, those details have to be added to ~ns-2.35/Makefile.in as specified below in the OBJ_CC variable. For each .cc file, there need to be a .o file to be added. GreenCloud is a best open source tool that analyse the performance of a data center by varying parameters of the cloud and also gives a provision to add or modify existing source code to define new metrics for a cloud. Any questions on installation or tuning the GreenCloud are always welcome.